TV show dates: September 21, 2018. Performers include: Emma Stone, Jonah Hill, Justin Theroux, Sonoya Mizuno, Sejal Shah, Aaralyn Anderson, Alexandra Curran, Julia Garner, Billy Magnussen, Christian DeMarais, Rome Kanda, Geoffrey Cantor, Josh Pais, Rob Yang, Gabriel Byrne, and Selenis Leyva. From creator Patrick Somerville, the Maniac TV show is a dark science-fiction comedy-drama, based on the Norwegian television series of the same name. The story unfolds in a time and place somewhat like our own. Disaffected and void of direction, Annie Landsberg (Stone) is obsessed with her family members’ failed relationships. Meanwhile, Owen Milgrim (Hill) is the fifth son of a wealthy New York industrialist family and has spent his life struggling with a contested schizophrenia diagnosis. These two strangers come together thanks to a mysterious pharmaceutical trial. Since their lives have been difficult, the idea of a new medication that can treat their ills fills them with hope. Dr. James K. Mantleray (Theroux) has developed a sequence of pills which he claims can fix anything wrong with a person’s mind, from mental illness to heartbreak. News of his invention lures Annie, Owen, and ten other people, to Neberdine Pharmaceutical and Biotech’s facilities, for a three-day drug trial. Dr. Mantleray assures these prospective patients that his new regimen will permanently solve all of their problems, and the cure is without complications or any kind of side-effects. Will everything go as planned, or is it too good to be true? Stay tuned. First aired: September 21, 2018. What do you think? Do you like the Maniac TV series? Should this Netflix TV show have been renewed for a second season? 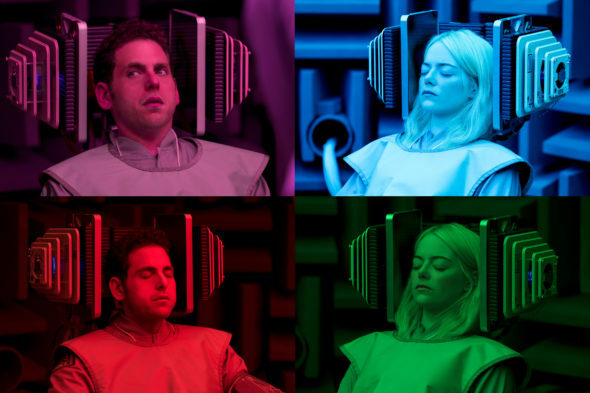 More about: Maniac, Maniac: canceled or renewed, Maniac: ratings, Netflix TV shows: canceled or renewed? I loved the show. They tied it up pretty nicely at the end though. We loved it. Don’t know if you could continue this story, but another season=another story would be great.